Roger Ackroyd knew too much. He knew that the woman he loved had poisoned her brutal first husband. He suspected that she was being blackmailed. Then came the news that she had taken her own life. But, before he found all the clues, he was murdered. 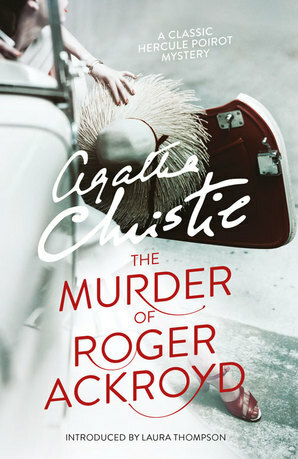 This was my first time dipping into the world of Agatha Christie’s novels. The detective story can be rather formulaic but this one diverges from the formula in an interesting way which makes it stand out from the usual mould. I can’t disclose any more on that front without completely ruining the book. It’s the twist that really makes the story. Until I got to the twist it was a fairly standard affair. Christie writes good stories, but her writing isn’t exactly inspiring. The writing is pretty basic but I guess that makes it an easy read that will suite some. That’s the thing about these kind of novels, they’re the sort you read casually on the train or on holiday. The characters are your standard mix of suspects and investigators with nobody particularly different, unusual or interesting. The setting as well is the typical country town. But if this is the kind of read you’re looking for then this isn’t a problem, it’s what you’d expect from a Christie. This is one of those books that now I know what happens and what the twist is I may reread it at some point because it would be completely different reading it a second time with that knowledge. Obviously I can’t compare it to other Christie novels as this is my first but I’d say it was a pretty good one. It’s all about the twist at the end though. I didn’t find the build up to it that exciting. Today is the second cover reveal for Dissonance. The new cover is designed to fit with the next book in the series which will be coming out soon! Fifteen-year-old singer Allie Grant lives crippled by her illness. Though kept in isolation, she’s never alone: A spirit names Song lurks in the silence of her bedroom. Her first novel, Dissonance, was publishing independently in June of 2015. Mockingjay Part 2 is the final instalment of the series and the second part of the final book. My expectations were high for this one, as the previous films had been so good and so well adapted from the books. I went in not really being able to remember much of the book as it was a while ago since I read it. So it was nice to be able to sit and watch without waiting for what I knew was going to happen the whole way through (like sometimes happens when watching book to film adaptions). I’m not sure how well splitting Mockingjay into two parts worked. I think it would be much more impactful watching them together. I like that it meant all the major things that happened in the book got to go into the films. A lot happens and if it were one film it might have felt a bit butchered. Yet somehow I think the plot progression would be more effective over one film. Although it would have had to be a very long film to fit everything in, so maybe two films was the right path. This film reminded me why I love this series so much. There are so many twists and turns which are so unexpected so that the first time you read the books or watch the films (having not read the books) you’re on the edge of your seat. I like that there is no binary of good and evil. You realise that’s a model which isn’t really realistic. The acting was top notch once again and the costumes and effects were brilliant. I’m going to have to watch it again though as I didn’t take in much of the first fifteen minutes as the kids in the row in front of me were talking so much. A great end to the series, though I’m sad it’s the last time I’ll see a Hunger Games film in the cinema.